It’s Week Two in the Texas Beef Council’s Healthy Meals to Fuel the Family campaign, and this week we want you to Power Up with Main Dish Salads! A healthy diet and lifestyle not only give you energy, but are some of the best weapons for fighting heart disease. The good news is that a heart-healthy diet includes many of the foods you love! Research has shown including moderate amounts of lean proteins, such as lean beef, in your diet may help reduce the risks of heart disease by increasing satiety, improving muscle composition and reducing blood cholesterol levels. The Skinny on Ground Beef. Ground beef is another versatile beef option that will save you money. Purchase 80% lean ground beef, which is less expensive than 95% lean, and use the simple rinse process to reduce the fat content by half. To do this, brown the ground beef. Then use a slotted spoon to remove beef crumbles onto a plate lined with paper towels and let it sit for 1 minute, then blot the top with more paper towels. Next, place beef in a colander over a large bowl and pour very hot (not boiling) water over the beef. Drain for 5 minutes. Freeze and Save. Stock up on your favorite, inexpensive cuts when they go on sale and make sure to store and freeze them properly. Beef can be frozen in its original, transparent packaging for up to 2 weeks. For longer storage, prevent freezer burn by re-wrapping beef in moisture-proof, air-tight wrapping materials such as heavy-duty aluminum foil, freezer paper or plastic freezer bags. Steaks and roasts can be stored for 6 to 12 months in the freezer while ground beef can be stored frozen for 3 to 4 months. 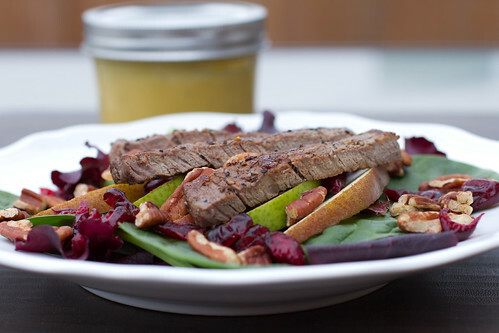 This week, I made Tenderloin, Cranberry and Pear Salad with Honey Mustard Dressing. The Nerd is not really a salad person, but he really enjoyed this salad. 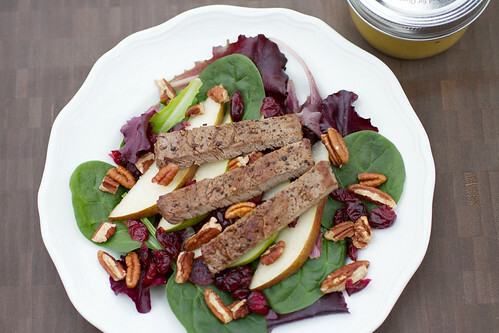 The roasted pecans are a wonderful addition to the pears and cranberries in the salad. I didn’t really like the honey mustard dressing (it was too tangy for my taste), but you could top this salad with your favorite dressing. Season steaks with pepper. Heat a large nonstick skillet over medium heat until hot. Place steaks in skillet and cook 7 to 9 minutes for medium rare to medium doneness, turning occasionally. Meanwhile, whisk Honey Mustard Dressing ingredients in small bowl until well blended. Set aside. Divide greens evenly among 4 plates. Top evenly with pear wedges and dried cranberries. Carve steaks into thin slices; season with salt as desired. 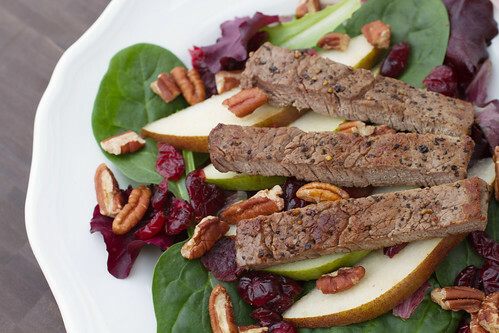 Divide steak slices evenly over salads. Top each salad evenly with dressing, pecans and goat cheese, if desired. Be sure to follow the other nine Texas Beef Bloggers to see the other fun recipes they’re sharing! You can also follow our Fuel for the Family board on Pinterest! And mark your calendar! 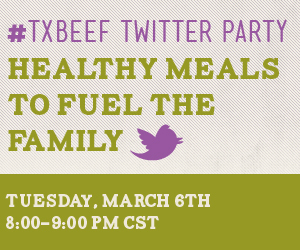 We’re having a Texas Beef Twitter Party on Tuesday, March 6 from 8 to 9 am! Join us using the #TXBeef hashtag for tips on creating healthy meals to fuel your family!